Seller will give you a gift certificate in the amount of 5,4 RUB for a positive review of the product purchased. 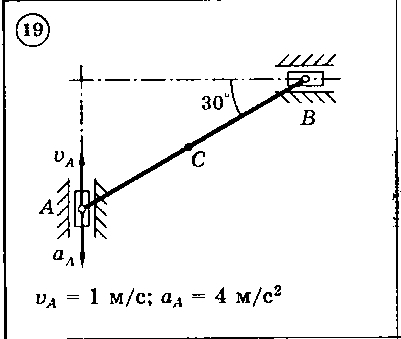 For in Scheme 1-30 mechanism consisting of a rod AB 2 m and two sliders, for given values of speed and acceleration slider A to determine the velocity and acceleration of the slide and in the mid-point of the connecting rod and the angular velocity and angular acceleration of the rod. Right after the payment you receive a link to the archive with the solution of the problem in theoretical mechanics K3 B19 (skhema19) in the test book "theoretical mechanics" Dievskaya VA Malyshev IA 2009 for university students. After checking the solutions I would be very grateful if you leave your positive feedback. Seller will give you a gift certificate in the amount of 5,4 RUB for a positive review of the product purchased..